This is the traditional exterior plaster for the exterior of a building. It is normally applied over galvanized metal lath, in a three coat process. The first coat is Scratch Coat. The purpose of Scratch Coat, which is applied directly to the lath, is to create a rigid surface to which the Brown Coat is applied. The Brown Coat is the second part of the application, where the mud is shaped into the desired product. In most cases the shape is a wall or ceiling. The Scratch and Brown coats, in the stucco application, are made up of a combination of water sand, portland cement, and lime. The finish coat is usually done with a rich mixture of screened sand, white cement, lime, pigment, and water. In most areas, a premixed stucco finish can be purchased through a local supplier. 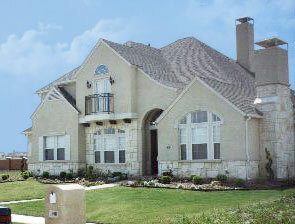 USG and Texstar manufacture stucco finishes and sell them in the Dallas area. Top of Page | Contact Us | Site Map Copyright © 2000-2009 Plaster, Inc. All Rights Reserved.